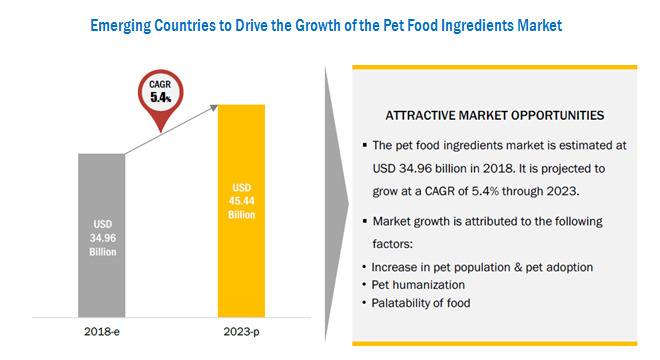 [176 Pages Report] The pet food ingredients market was valued at USD 33.28 billion in 2017; this is projected to grow at a CAGR of 5.4% from 2018, to reach a value of 45.44 billion by 2023. 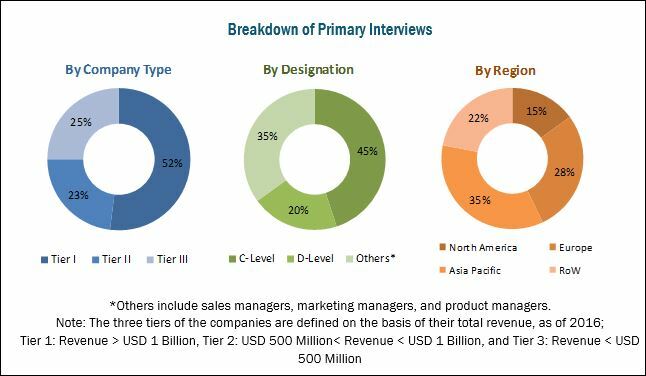 The basic objective of the report is to define, segment, and project the global market size of the pet food ingredients market on the basis of ingredient, source, form, pet, and region. It will also help to understand the structure of the pet food ingredients market by identifying its various segments. The other objectives include analyzing the opportunities in the market for the stakeholders, providing the competitive landscape of the market trends, and projecting the size of the pet food ingredients market and its submarkets, in terms of value (USD million) and volume (KT). This research study involved the extensive use of secondary sources, which included directories and databases—such as Hoovers, Forbes, Bloomberg Businessweek, and Factiva—to identify and collect information useful for a technical, market-oriented, and commercial study of the pet food ingredients market. The primary sources that have been involved include industry experts from the core and related industries and preferred suppliers, dealers, manufacturers, alliances, standards & certification organizations from companies; and organizations related to all the segments of this industry’s value chain. In-depth interviews have been conducted with various primary respondents such as key industry participants, subject matter experts, C-level executives of key market players, and industry consultants to obtain and verify critical qualitative and quantitative information as well as to assess future prospects. The following figure depicts the market research methodology applied in drafting this report on the pet food ingredients market. Key participants in the pet food ingredients market are the pet food ingredients manufacturers, suppliers, and regulatory bodies. The key players that are profiled in the report include Archer Daniels Midland Company (US), Koninklijke DSM N.V. (Netherlands), Cargill, Incorporated (US), BASF SE (Germany), Ingredion Incorporated (US), Roquette Frères (France), SunOpta (Canada), Darling Ingredients Inc. (US), Omega Protein Corporation (US), DowDuPont Inc. (US), Kemin Industries, Inc. (US), InVivo (France), and John Pointon & Sons Ltd. (UK). 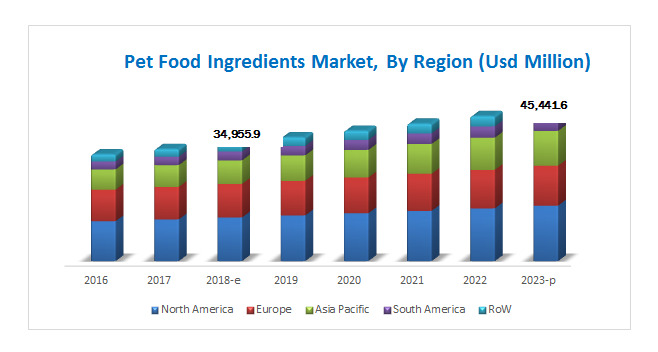 The pet food ingredients market is estimated at USD 34.96 billion in 2018 and is projected to reach USD 45.44 billion by 2023, growing at a CAGR of 5.4% during the forecast period. The increasing pet population and pet adoption trends that are leading to a need to improve the palatability of pet food are some of the key factors influencing the growth of the pet food ingredients market. Based on ingredient, the market has been segmented into cereals, meat & meat products, vegetables, fruits, fats, and additives. The meat & meat products segment dominated the market in terms of value in 2017. Meat & meat products form a key source of proteins, which are an essential nutritional requirement for the development of pets. They are obtained at a relatively lower cost, as the majority of these ingredients are byproducts of food products manufactured for human consumption. This serves as an economical solution for pet food manufacturers. Along with being cost-effective, meat & meat products enhance the palatability and acceptability of pet food. In terms of type of pets, dogs accounted for the largest share of the global pet food ingredients market in 2017. Growing concerns about pet health and the rising cognizance about the benefits of commercially manufactured pet food have led to the tremendous growth of the concerned market in developing as well as developed countries. A majority of European and North American countries have been witnessing a trend of premiumization and are feeding their dogs with high-quality dog food. With multinational dog food manufacturers capitalizing on this trend and strengthening their presence in emerging markets such as China and Brazil, the market for dog food ingredients is projected to grow at a steady rate. In terms of form, the dry ingredients segment accounted for the largest share of the global pet food ingredients market in 2017. Dry ingredients are used in pet food on a large scale, and their popularity can be attributed to their cost-effective nature, and low moisture content, which facilitates convenient handling during processing and storage. Significant demand for dry pet food is also one of the factors fueling the growth of the dry segment in the pet food ingredients market. As opposed to animal-based ingredients such as fresh meat, which has a higher moisture content, meat meal being dehydrated is more concentrated and economical. There are several manufacturers with a strong portfolio of dry pet food ingredients. Asia Pacific is projected to be the fastest-growing market for pet food ingredients during the forecast period. This is attributed to the rise in pet food demand in Asia Pacific countries, such as China, Australia, and India, along with a higher focus on overall pet health. Regional markets such as India, China, and Japan are projected to drive the growth of the regional market, owing to the increasing rate of pet adoption by the growing number of nuclear families in these countries. China is projected to dominate the region in terms of both value and volume, during the forecast period, owing to the presence of local pet food ingredient manufacturers who offer pet food grade ingredients at the lowest price, as compared to other countries in the region. The key challenge faced by the pet food ingredient manufactures is the increase in instances of counterfeit products being sold in the recent years. The presence of counterfeit products negatively affects the pet food market and the health of pets. Such challenges hamper the pet food market, which further affects the pet food ingredients market. Players such as BASF SE (Germany), Archer Daniels Midland Company (US), DowDuPont (US), Cargill, Incorporated (US), and Koninklijke DSM N.V. (Netherlands) have been actively strategizing their growth plans to expand in the pet food ingredients market. These companies have a strong presence in Europe and North America, and also have manufacturing facilities and a strong distribution network across these regions.